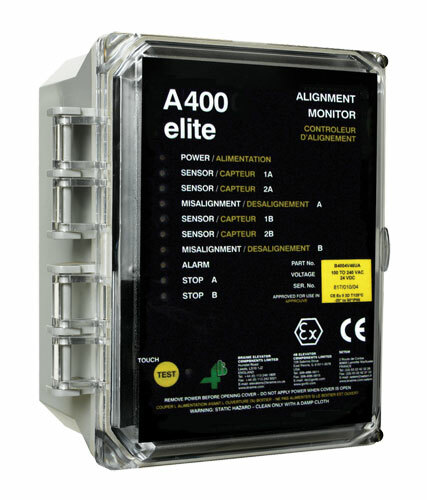 The A400 Elite Trackswitch belt misalignment monitor uses 4B WDA or BAP magnetic proximity sensors to monitor the alignment of the belt in bucket elevators. Each control unit incorporates two independent monitoring circuits for early detection of belt misalignment on one or two bucket elevators. The 4B magnetic reluctance sensors operate in pairs to detect the position of steel bolt heads or steel buckets as they pass through the sensor's adjustable magnetic field. Nuisance / false alarms are tuned out by setting a tolerance window on each sensor which allows for normal belt travel. Status LEDs on the control unit indicate the alignment condition of the belts on the elevators, while internal relay contacts provide alarm and automatic shutdown of the elevator when hazardous misalignment conditions are detected.